The BEST DEAL ON THE PLANET for Chester Comix, the educational comic book series with Free Teacher Guides! Members save up to 54% on this Co-op member favorite, depending upon the products selected. Bring History Alive with Chester the Crab! Join the goofy hat-wearing Chester the Crab on his colorful and witty romps through U.S. history. For two decades, Bentley Boyd has written and drawn these important American stories for kids ages 9 and up. Comic books in the series contain 4 related stories narrated by the Chesapeake Bay blue crab. Individual pages have headlines in the form of questions that make great writing prompts and that fit easily into one day's lesson plan. 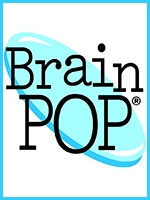 Extensive Teacher Guides amplify the learning with vocabulary help and reproducible activities closely matched to the individual books. The complete Chester Comix history series -- The Chester Comix Superbundle, in either print form or as downloadable PDFs -- covers topics such as European exploration of the Americas, the Revolutionary War, the Civil War, and U.S. westward expansion. Some books are a collection of four biographies of important Americans. 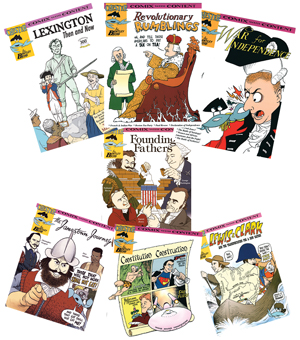 Or you can focus on certain historic era by choosing from three exclusive bundles for Co-op members: Chester Comix Revolutionary War (8 printed books or 7 digital books), Chester Comix Civil War (7 printed books or 7 digital books), and Chester Comix Civics (7 printed books or 8 digital books). Browse the Chester Comix website. 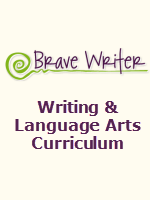 Download a sample Teacher Guide. Each Chester Comix book comes with a FREE Teacher Guide (PDF). Fulfillment: Within seconds of receiving your order, the Co-op will forward your order information to the author, Bentley Boyd. Bentley will ship the Chester Comix Superbundle Print Version within 5-7 business days. Thereafter, please allow 5-7 business days for delivery. If you ordered any download version, Bentley will send you a link in an email via the "YouSendIt" download service. 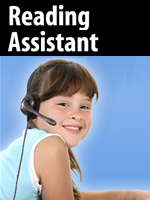 Look for an email from YouSendIt within 2 business days of placing your order. Shipping: The Chester Comix Print Versions ship via USPS First Class Mail. The cost to mail the Superbundle is $11 (it's nearly 5 lbs of books!) The cost to mail the smaller bundles (8 Chester Comix books) is $5 each bundle. Please allow 14 days for delivery before sending inquiries. Sorry - expedited shipping is not available. The League of Homeschool All-Stars: The print version of The League of Homeschool All-Stars can be ordered as an add-on to any Chester Comix Print Version order, and ships for no additional charge. 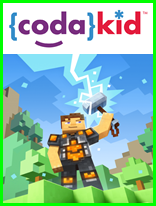 Service Fee: The Co-op will charge a one-time, nonrefundable service fee of $3 to help cover some of our cost of providing this service. U.S. Members Only: We're sorry! We can only offer shipping to U.S. (and military) addresses. To get the print version of League of Homeschool All Stars, you must order it separately (see below) ALONG WITH your order for the Chester Comix Superbundle Print Version. George Washington Leads the Way is available only in print, as part of this Print Version. 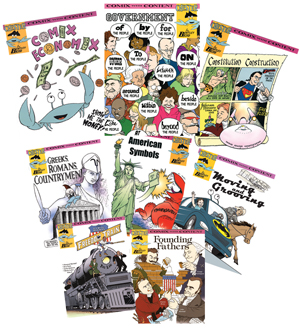 The Chester Comix Superbundle Download Version includes PDF's of 29 Chester Comix books (see below), plus Teacher Guides (PDF). This bundles more than 650 pages of exciting and funny non-fiction storytelling. Note: The Download Version substitutes Homeschool All Stars for George Washington Leads the Way, and Tar Heel Tales for Revolutionary City. The paperback version of George Washington Leads the Way is available only as part of the Superbundle print version (see above), along with Revolutionary City and Alexander Hamilton and the Federalist Era. Enter "1" in the Qty space above. Complete the rest of the order form. Within minutes of receiving your order, the Co-op will forward it to Bentley for fulfillment. Please allow 2 business days for Bentley to email you a link that you can use to download the Superbundle to your computer. The email will come via a download service called "YouSendIt". If you don't receive the YouSendIt download email within 2 business days, please contact Bentley directly at chestercomix@yahoo.com. Please do not contact the Co-op; we'll simply refer you to Bentley, as the download link must come from him via YouSendIt. Please note that the download file contains the eBooks inside one zipped folder (280mb) for download. 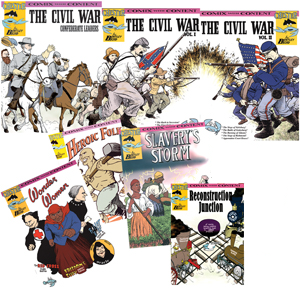 To get the print version of League of Homeschool All Stars, you must order it separately (see below) ALONG WITH your order for the Chester Comix Revolutionary War Bundle Print Version. 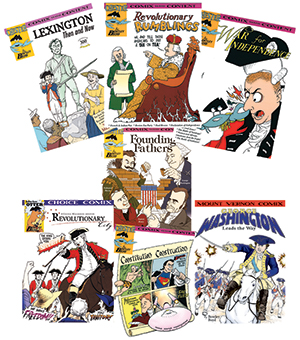 Note: There is a difference with the titles included between the print and digital versions for the Revolutionary War Topic. If you are interested in the Revolutionary City, George Washington Leads the Way, and Alexander Hamilton and the Federalist Era titles, you will need to order the print version above. Please note that the download file contains the 7 eBooks inside one zipped folder (140 mb) for download. To get the print version of League of Homeschool All Stars, you must order it separately (see below) ALONG WITH your order for the Chester Comix Civil War Bundle Print Version. Please note that the download file contains the 8 eBooks inside one zipped folder (120 mb) for download. To get the print version of League of Homeschool All Stars, you must order it separately (see below) ALONG WITH your order for the Chester Comix Civics Bundle Print Version. Please note that the download file contains the 8 eBooks inside one zipped folder (90 mb) for download. 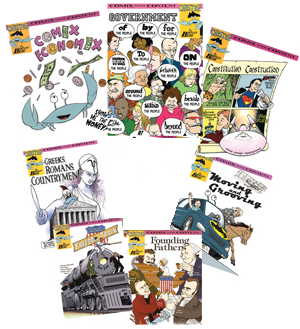 NOTE: To purchase The League of Homeschool All-Stars, you must ALSO purchase the Chester Comix Superbundle Print Version, above, as part of the same order. The Homeschool Buyers Co-op is pleased to offer The League of Homeschool All-Stars, also by Bentley Boyd. Created at the request of the Homeschool Buyers Co-op, and available exclusively through the Co-op, The League of Homeschool All-Stars features 1-page biographies of famous homeschoolers that are sure to inspire young homeschoolers to be the best they can be! Page after page highlights the stories of HOMESCHOOLED folks that have made a mark in history. Andrew Wyeth, the "Painter of the People"
WOW! We think you and your family will be amazed by this diverse group of men and women and inspired by their AWESOME accomplishments! Enter the quantity of books you want in the QTY space above, up to a maximum of 3. If you would like Bentley's inscription addressed to any particular person, please enter his or her name in the "Comments" field below. If you are ordering multiple books and would like each book inscription addressed to different people, enter their names in the "Comments" field separated by commas. IMPORTANT! 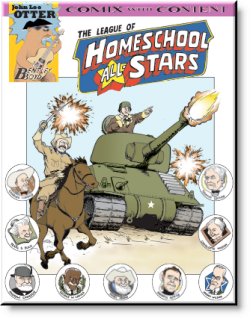 The print version of The League of Homeschool All-Stars is available only as an add-on to a purchase of the Chester Comix Print Versions (above), i.e., you MUST also purchase a Chester Comix Print Version as part of the same order. It will be included in your shipment of the Superbundle Print Version for no additional shipping charge. 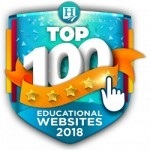 Please note that The League of Homeschool All-Stars is included in the Download Version at no additional charge.